GammonLife.com is honoured to publish this very first interview with Mr. Philip Vischjager of The Netherlands who just won the 2006 World Championship of Backgammon in Monte Carlo last month. GammonLife - Hi Philip, congratulations for winning the World Championship in Monte Carlo last month and thank you for accepting this exclusive first interview with GammonLife.com. Could you please tell us a little about yourself? Philip Vischjager - I am 47 years old and married since December 1989. We have two children; a girl who is 15 years old and a boy who is 14. After finishing a higher business economic study I started to open retail stores (jeans related) with my brother Raymond in the early 1980s. In the mid 90s we had reached 10 casual clothing retail stores in Amsterdam, Rotterdam, The Hague and Utrecht. We have since sold the stores but kept the real estate which we lease. I continue to buy interesting pieces of real estate and then lease them afterwards. GammonLife - Tell us about your life in backgammon, when and how did you first start playing backgammon and how did it evolve from there? Philip Vischjager - I first started playing and learning the game at the age of 15 by watching the better English players (Scalamandre, Olsen) American players (Lester, Magriel, Robertie) in tournaments - mostly I did learn a lot. Also in the Netherlands the game was very hot at that time and we had, easily, 10 local tournaments every year that about 100 people attended per event. We did have sponsorship for the events at the time, from a number of casinos that offered free food and drinks. I remember winning a Jackpot at the age of 19 in Amsterdam. Besides that we could also learn the game by buying the books of Magriel, Dwek and de Young. We had some local good players as Labrosse, Armari, Eitan, Vischchraper and Khan who were playing every day. I remember that these players and I went to play in the Monte Carlo World Championships yearly from 1979 until 1984. Later (from 1985 to 2000) I had very little time to play, because of my work. In the 90s we had two very strong competitors (Schreuder and von Eijck) in Amsterdam who played the major international backgammon circuit and were both listed in the Giants of Backgammon in 1993 and 1995. Both have since lost interest in the game, Schreuder now plays Poker. In 2001, I began to play backgammon again in the Dutch Open Championship tournaments (2001, 2002, 2003 and 2004) and also in Amsterdam Open Championship. I was very successful making it to the final of the Dutch Open three times winning twice and I also won the Amsterdam Open twice. Fortunately I was able to learn from computer programs training with Snowie and GNU. They are a huge advantage when it comes to solving position problems and analysing matches! For the last two years, I have been playing in international tournaments. By the end of 2006, I will have played in eight or nine tournaments this year - Paris, Velden, Oostende, Monte Carlo, Antwerp, Paris and a few others. In the Paris Open in March of 2006 I lost in the Final 4. GammonLife - You have won the most prestigious title in the world of backgammon - please tell us how that feels? Now after a few weeks the days are getting nicer and nicer and I feel more and more happy every day! GammonLife - So tell us some of the other things that happened during this memorable week in Monte Carlo, and your thoughts as you progressed closer and closer to the final? Philip Vischjager - Monte Carlo was my fourth tournament this year. It seems strange but I do feel that the tournament before this one (Oostende) helped me in my progression to the final in Monte Carlo. Since I lost every match in Oostende - DMP against Rumcker, DMP against Serrero the new European Champion, and losing the Last Chance against Bennett - I had no huge expectation for Monte Carlo. The advantage was that I did not feel any pressure at all! This did not change at all after I saw the draw giving me a bye in Round 1. In Round 2, I had to play against Olivier Egger of Switzerland but still I did not feel any pressure. After I won my match reaching the Last 64, I knew my next match against Peter Heitmuller of Germany would be difficult, but I also felt that I did not have much to lose as I was not the favourite. The next match was slightly more difficult as I did not know much about my opponent Christian Liebe-Harkort of Germany. After that match I progressed to the Final 16. I felt even more comfortable (last 16 was further than expected) and a new opponent Hans Liby of Norway. Again I was not the favourite but saw good chances as the match progressed. However, after five hours of play, we reached a score of 20-20 in the 21-point match. The good thing that I do remember was that my opponent was more nervous at the score of 20-20. After this match, it was already 10 p.m. and I told my next opponent, Timo Vaatainen of Finland, that I had to have something to eat. I started the match at 11:20 p.m. (again a 21-pointer) against who I believe was my toughest opponent in Monte Carlo taking into consideration the time of the day, the will to reach the semi-finals and that Timo showed a lot of control and determination. The Final 4 and the match brought a whole new dimension to the game… make-up, cameras and a referee! The match started at 9:40 pm. I do remember that my opponent was not relaxed at all; he came to me just before the match and told me not to say a word to him until the match was finished... it was against Kazuhiro Shino of Japan and was very short, I won 23-6. Suddenly after the match the cameras were after me asking "what do you think about the final?" Luigi Villa of Italy, the other finalist, was there too and I told them in Italian that I thought that Luigi was the favourite because he had already won the World Championship in 1979 and because he had beat Andreas Humke of Germany (one of the best players) in the other semi-final coming back from a 14-1 deficit. GammonLife - Tell us what was going through your mind in the final match? Philip Vischjager - The final started at 3 p.m. and lasted almost six hours. In the beginning I started well but later could not maintain the advantage and I began to worry a little. The brains were not functioning correctly anymore and the dice changed to his advantage. Although I tried to keep calm when he was leading 23-21, it was not so easy anymore. Fortunately, a couple of short games later and suddenly the score was 23-23 (double-drop twice). The following game I waited to double (to try to double him out) and although I felt it was a take (take point was 30%) he dropped the double and I was now leading 24-23. At this point, I knew everything could still go wrong but the score gave me the feeling of being in control. The last game started well for me and he could not come down from the bar in that game for a very long time, but at the end I had to give a couple of shots during bearoff and while he did hit a checker when I had 10 checkers borne off, I was fortunate enough to save this game and take the world title. GammonLife - Congratulations too for winning a free entry to the PartyGammon Million tournament in The Bahamas in January 2007 courtesy of PartyGammon. How do you feel about that and how will you prepare for this shot at a minimum of $500,000 in first-place prize money? Philip Vischjager - I do understand that the best players of the USA shall participate in the PartyGammon Million tournament in The Bahamas but I shall prepare myself by playing between now and then in tournaments against humans and also train with my computer programs. I will analyse a lot of matches played by myself (learning from my errors) and also those played by other players. I will also participate in a couple of big European tournaments to get myself prepared. GammonLife - As the new ambassador of the game of Backgammon, how do you intend to support and promote our game? 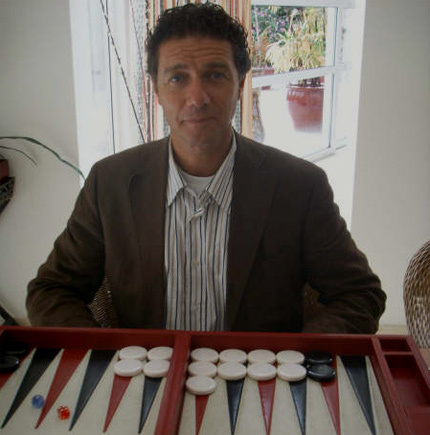 Philip Vischjager - To promote Backgammon I shall give free lessons to young beginner players in the Netherlands. Today a friend told me that Eurosport will promote Backgammon next fall with 10 one-hour shows on TV. I will do whatever else I can to support our game. GammonLife - How many players are there in The Netherlands and who are the strongest ones in The Netherlands? Philip Vischjager - We have a couple of good players but most of them do not play on the international tour. An exception is Rogier van Gemert who is probably the most promising player - watch for him over the next couple of years. Other good tournament players are van Ingen, Sikkema, Alma, van Rooyen and van Dijck. In total a couple of thousand people play Backgammon regularly in the Netherlands. The problem is that I do miss the interest of young players (teenagers) as they prefer to play other games like chess and poker. Let’s hope that changes soon. GammonLife - Thank you Philip, good luck!